Trayvon Martin has now been dead for over a month. 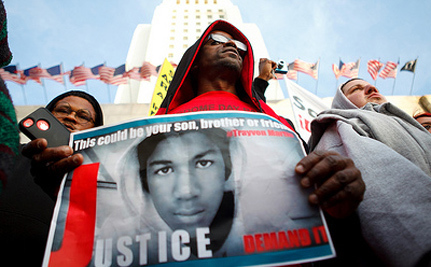 We know that George Zimmerman shot the 17-year-old to death, but no arrest has been made. That’s because of so-called “Stand Your Ground” legislation, state laws assuring an expansive right to self-defense. Since “Stand Your Ground” laws allow people who feel threatened to use deadly force—even if they have an opportunity, as Zimmerman did, to safely avoid a confrontation—Zimmerman has not been arrested or charged. The law allows use of deadly force by someone who simply feels threatened by another, even when confrontation is avoidable. Zimmerman has claimed self-defense even though Martin was unarmed. Most states have long allowed the use of reasonable force, sometimes including deadly force, to protect oneself inside one’s home — the so-called Castle Doctrine. Outside the home, people generally still have a “duty to retreat” from an attacker, if possible, to avoid confrontation. In other words, if you can get away and you shoot anyway, you can be prosecuted. In Florida, there is no duty to retreat. You can “stand your ground” outside your home, too. Prosecutors hate “Stand Your Ground” laws because they make it much harder to successfully prosecute people who claim self-defense. In Florida, a defendant doesn’t have to actually prove he acted in self-defense; instead, the prosecution has to prove “beyond a reasonable doubt” that he didn’t do so. In fact, the Florida law asks the police to make a factual determination in the moment, before a case even reaches a court. Generally these determinations are made by the courts. The upshot? In 2010, the Tampa Bay Times reported that “justifiable homicides”—i.e., killings that were deemed legitimate—have skyrocketed in Florida over several years since the “Stand Your Ground” law went into effect. Now, tragically, it appears that rather than use this as a learning experience, the National Rifle Association is pushing all 50 states to adopt these so-called “Stand Your Ground” laws. The National Rifle Association continues to press more states to adopt Florida-style “stand your ground” laws like the one that’s made it difficult to prosecute George Zimmerman. The proliferation of these laws is part of a deliberate lobbying campaign by the NRA. In 2005, at the NRA’s urging, Florida became the first state to pass a “stand your ground” law. Before that, most states required you to retreat from a confrontation unless you were inside your own home. Now 25 states have these “stand your ground” laws, which critics call “shoot first” laws (Gawker’s pseudonymous blogger ”Mobuto Sese Seko” calls the laws “a great, legally roving murder bubble”) because they authorize citizens to use deadly force even if the person who makes them feel threatened is, like Martin, unarmed. Click here for a map of the current situation across the U.S.
25 states have already adopted such laws despite their demonstrated danger. If you believe this is outrageous, please sign our petition telling all states to reject all “Stand Your Ground” laws before even more people are murdered for presenting imaginary threats. Trayvon Martin: What Does The Rest Of The World Think? No more stupid, over-reactive legislations. Signed. How many more must die before somebody do something to stop this endless cycle of nonsense! Julian - "Wish there wasn't this stupid limit on these comments. It's hard to divide it up evenly"
@Robby C I didn't forget about you but it was getting so late and I wound up explaining so much that I'll have to finish it up later today. I'm only writing so much to explain a lot of the reasoning, so you at least know why I have certain opinions, since you asked me, that's all. It's not about any documents or anything like that but just some food for thought, even if you disagree with some of it. Wish there wasn't this stupid limit on these comments. It's hard to divide it up evenly - also wish I hadn't said so much that's it's hard to post it! It sounds like you believe in the 2nd ammendment w/certain restrictions. I have no problem w/that, but at same time, I see an alarming trend developing when it comes to gun control, since so many countries have banned them completely & the UN has wanted it's small arms treaty for years, etc. That scares me. So it's tough for me NOT to jump in when I see more desire for gun control. But based on my research, right before BO took office, ~42% of the US owned guns. Now, it's ~47%. I can't verify these stats, but I don't think it's tough to see that MORE people DO own guns now. Our nation is more racially divided & there is more fear & anxiety in the populace than ever before. It leads to many of the situations we're currently seeing & the more that people gun others down, the more people want guns for protection. It's very scary, but making guns illegal (again, not implying you're wanting that) is only helping criminals. Somewhere there is a balance. Just browsing through some old posts. On April 2, you commented that the dusty old Constitution allows gun possession and that you're sorry that if other people's rights bother us, we should go live in another country that doesn't allow guns. The Constitution certainly doesn't allow unlimited firearm ownership, but, of course that is where the argument lies and people have that right. But whether you like it or not, when one person's right conflicts with another person's right, we don't move to another country, Carlos, that's called dictatorship where only one person gets to choose rights. No, the Constitution provides for a Supreme Court to decide such arguments. YOU don't get to decide.